Former NASA astronaut Mike Massimino describes his path to space and two shuttle missions in a new book that follows his journey from a weak-eyed kid, to a research engineer, to — finally — an outer-space repairman of the Hubble Space Telescope. Space.com: Why did you set out to write a book about your experiences? 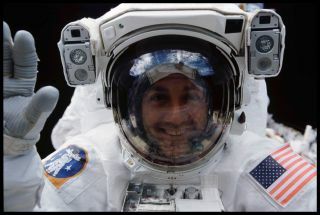 Mike Massimino: I seem to enjoy, a little more than my colleagues [do], the opportunity to share stories about how cool it is to be an astronaut. I think it's the greatest job in the world, and the more ways you can let people know about it and the stories that each one of us has — we all came different ways to get there, and it really is a dream come true. It's the kind of job where you dream about it, and you think it might be impossible because it's so difficult to get in there, and sometimes it works out. And that alone is great — it's a wonderful story. What I really wanted to share, and I think maybe what they might have saw in it when we first started, was to try to make it really personal and talk about the emotion, the feelings behind it. You could talk about all the technical part of it matter-of-factly, but it's the personal experience, the relationships and the emotions going into it that we also wanted to share. Space.com: Were you surprised by anything that made it into the book? There was a theme that came out in the book, when I was talking to my co-writer [Tanner Colby] about it. It kind of came down to three messages; two of them I expected. One of them was pursuing a dream, and never giving up. That was a theme that I thought was worth telling; when I speak to students around the country, I talk about the importance of that. The second theme was how cool it is to fly in space. It is amazing. You leave the planet, and you do this work in a spacesuit, and you view what it looks like, and you see these just utterly indescribable, amazing things — what that whole experience is, how cool it is to be an astronaut. The third thing that came out of it was this story of the importance of public service, service to others. I wasn't sure that was going to be a part of it, because I always felt like what I was doing was just having fun. … But I think there was more of that, because when we wrote the book, we started from the beginning of me growing up, and I talked about my dad working for the New York City fire department, and having that sense of wanting to do something in some sort of public service or service to others — how important it was to do things to hopefully contribute to the betterment of the world. To me, that was a bit of a revelation about me that I didn't really think much about before writing the book. Space.com: Was anything cut from the book you were sad to see go? Space.com: You got to fly to space twice and work on the Hubble Space Telescope, which you've called the greatest scientific instrument ever built. What are your thoughts on NASA's current slate of projects? But your question was, in addition to Hubble, what NASA's doing now. I think we're in a different phase now. I think NASA is still doing some great things, but it can't do all the great things in space, and I think that's OK. It's getting help, hopefully, from these commercial companies like SpaceX and Boeing with its commercial spacecraft, along with the SpaceX vehicle for commercial crew, but also the Richard Branson Virgin Galactic model and Jeff Bezos. I really hope he [Bezos] is going to be successful with his Blue Origin company and the New Shepard spacecraft. [SpaceX founder and CEO] Elon Musk wants to send people to Mars, and that's what we need. And I think NASA just can't afford to do all these things on its own. It's not like when I was a kid, going to Apollo, where they had a huge national goal that a lot of resources were devoted to. We just can't afford to do that anymore. It's not going to happen. … A budget from our tax dollars that is used wisely can do some great things, but it's not going to be on the order of what we did with Apollo anymore, maybe not on the order of what we did with the shuttle. Certainly it's something that could be great — and is — but it's not just NASA anymore. I expect some great things to be coming out of commercial space companies in years to come. Space.com: Would you go to space again, maybe on one of those commercial flights? Massimino: Yeah, I'd love to do that. I don't know if anybody's going to do any asking; I don't think I could afford the ticket. But yeah, I would love the opportunity to fly into space again, absolutely. Space.com: Would you go live on Mars? Massimino: I think Elon Musk's plan was to leave you there, right? I want to get on one and come back. I'm too used to television and pizza. When I got my travel orders to go to space, because it's a government operation, it said, "From Kennedy Space Center to low Earth orbit and return." To me, the "return" was very important … I'd love to go for a visit, but I would want to come back — or at least have the plan to come back. Space.com: What's your favorite piece of space hardware? It was fairly complicated and expensive, which is eventually why it had to be replaced. But while it did its thing, it was great. That's my favorite spaceship, but it's also the only one I've ever been on. I'm very biased that way. And I guess my favorite piece of equipment is the spacesuit itself that we do our spacewalks in. It is a miracle that that thing works. It is your own little spaceship. It keeps you comfy; it allows you to do your work; it protects you. It's used over and over again — it's been used for many years, refurbished and used again. The repair on the Hubble that I did — on the STIS instrument, in particular — required a lot of dexterity and being able to move and work and be comfortable in that suit for a long time. But at the same time, it protected me from the harshness of space. I got to know that spacesuit intimately well, and it's just a miraculous piece of machinery. Space.com: I'm sure everyone asks you this, but do you have any advice for people who want to be astronauts? I would suggest to people: Find something that you really love. You don't have to worry about [thinking], "Will this make me an astronaut?" As long as there's some sort of math, science, medicine, computers — whatever it is — something in the STEM field that you are interested in, do that. Don't say, "I want to become a medical doctor to become an astronaut." Become a medical doctor because you want to be a medical doctor. Find out something you really love, and do that as best you can, and then look for ways to apply that to the space program. And don't give up, either. That's the other thing. There are plenty of people that applied and got rejected and gave up — and if they didn't, they probably would have got my spot. So I'm glad they gave up. But I wouldn't recommend it for anybody; giving up is not a good idea.